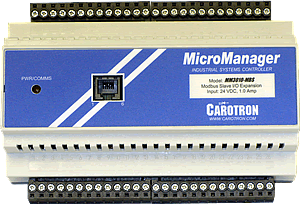 The MicroManager MM3010-MBS is a microprocessor based Modbus® RTU I/O expansion module. This Modbus RTU module is designed for use in industrial SCADA (Serial Control And Data Acquisition) applications. It provides analog and digital I/O plus frequency inputs that can be accessed/controlled over an RS485 Modbus® RTU network. Combined with an appropriate HMI Touchscreen, it becomes a simple, but powerful, data acquisition & logging system.